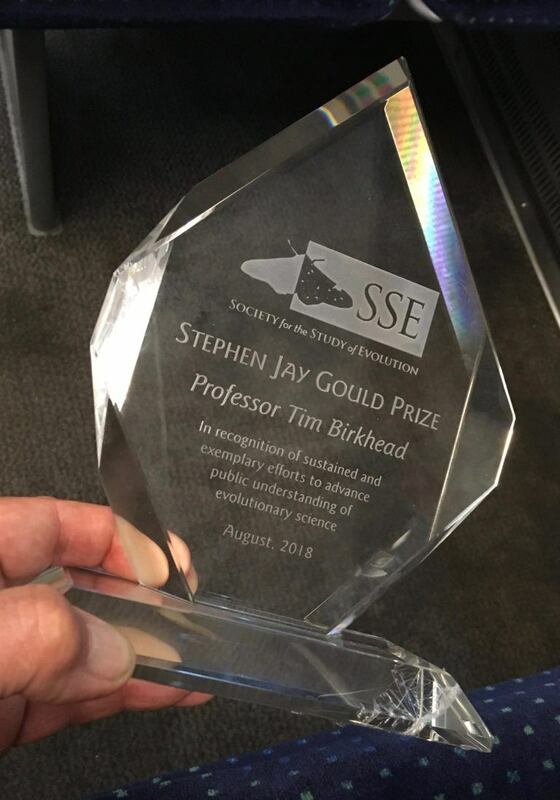 We are delighted that Professor Tim Birkhead has been award the Stephen Jay Gould award for communicating science. Professor Birkhead received the award at a ceremony in Montpelier, France in August. Tim Birkhead is Professor of Behavioural Ecology at Sheffield University and a Fellow of the Royal Society. He has won several teaching awards in honour of three decades of inspirational undergraduate teaching. His books include The Wisdom of Birds, Bird Sense, The Most Perfect Thing, and The Wonderful Mr Willughby, published in May 2018. The Stephen Jay Gould Prize is awarded annually by the Society for the Study of Evolution to recognise individuals whose sustained and exemplary efforts have advanced public understanding of evolutionary science and its importance in biology, education, and everyday life in the spirit of Stephen Jay Gould.